Arguably the most famous and influential artist of the 20th century, Pablo Picasso has maintained an unparalleled significance in the story of Modern art. Born in Spain on 25 October 1881, he began to draw from an early age under the guidance of his father, José Ruiz Blasco, who was an academic painter. After studying at the La Lonja art school in Barcelona, Picasso eventually moved to Paris and established a studio there. The progression of Picasso’s early work is largely categorized by the predominant color scheme employed in his works at any given time. His earliest artistic phase was the Blue Period (1901–04), featuring motifs from everyday Parisian life, and marked with implicit motifs of poverty and loneliness; this was followed by the Rose Period, which introduced more lyrical subjects such as jugglers, acrobats and other performers. A Rose Period work sold at Sotheby’s in 2004, the first work to sell for more than $100 million. Picasso’s subsequent transition to Cubism is marked by Les Demoiselles d’Avignon (1907, Museum of Modern Art, New York), the style that would inflect his work to varying degrees for the rest of his long career, which moved easily between mediums, including ceramics, sculpture, print making, and collage, all with the same virtuosic ability he possessed with painting. 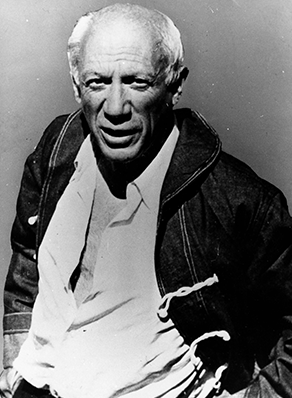 Although Picasso had lived in France for a number of years, the outbreak of the Spanish Civil War had a distinct impact on him. The bombing of the Basque town of Guernica by Franco’s government horrified the artist, and moved him to paint the powerful large-scale Guernica, 1937, a poignant anti-war statement first shown at the Spanish pavilion at the Exposition Universelle in Paris (and now in the collection of the Museo Reina Sofía, [WK1] Madrid). Picasso’s continued his prolific work until the time of his death, on 8 April 1973. His works are held in the major art collections around the world as well as many museums devoted exclusively to his oeuvre including Musée Picasso, Paris, Museu Picasso, Barcelona, Musée Picasso, Antibes, and the Museo Picasso Málaga.